I think it would be an understatement to say that this collection has been highly anticipated. A collaboration between MAC and the Chinese designer Guo Pei has been making some waves on social media, and it's not hard to see why. 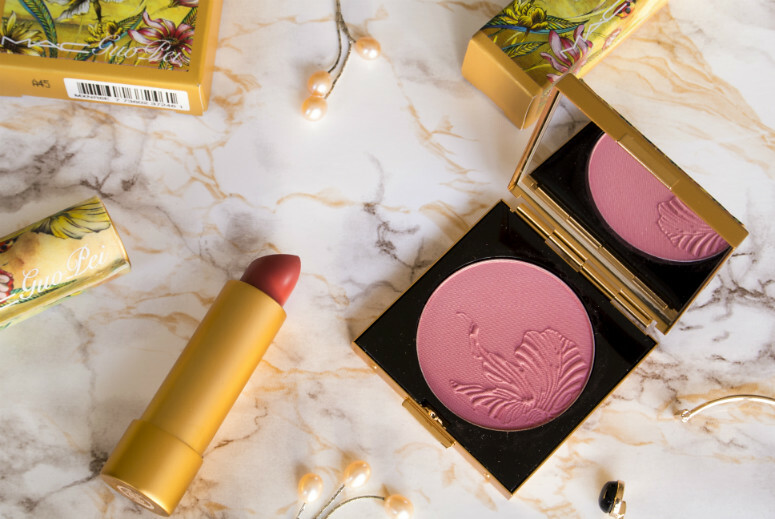 The beautiful gold packaging with beautifully floral-printed yellow fabric covering makes for a more decadent, and decidedly premium-priced makeup collection. Guo Pei is famous for her extremely elaborately decorated and hand-sewn pieces, and you can see (and read) how her attention to all details has been applied to this collection. Not only did she sketch the fabric covering design herself, she also designed six dresses as inspiration for the collection that took three years to develop. Three! I don't read much about the inspiration or timelines behind other MAC limited edition collections, but this strikes me as the work of someone who is dedicated to detail and is extraordinarily passionate about what they do. The collection itself has sixteen pieces, including eyeliners, lipstick and blushes amongst other things. I was actually sick the day of the release, but forced myself to stay up and refresh constantly in the hope that I would catch it as soon as it was out online. Then of course, I told myself it wouldn't hurt to sleep for an hour to help me recover, and lo and behold, it is released. When I wake up, most of it is sold out. Weep. I was lucky enough to catch the Beauty Powder from the website though, and a pilgrimage to Selfridges yielded me my lipstick and blush choice, so everything worked out in the end for the most part. The pieces are stunning to behold. I'm not surprised MAC slapped up the price for these, in fact, I'm sure they're a tiny bit more expensive than the usual limited edition pieces, though I may be wrong. The packaging is very very light, and almost fragile. I personally won't be carrying the blush anywhere with me for fear of breaking or scratching it. I also think the fabric covering (the first time MAC has ever used fabric coverings) might well pick up dirt rather easily, although it's more densely woven than some material, so if you want to keep it looking pristine, it may survive being carried around in a clean cosmetics bag. The etched flower on the powder and blush completes the beauty of these products, though it does make it a little bit harder to bring myself to swirl my brush in! I bought myself the blush in the shade Red Water Lily, which is a light coral pink. I would advise a very light hand with this one, as before I knew it, I had made myself look like I'd had one drink too many far too early in the morning, and this was using my RMK blush brush which I use to tone down my more pigmented blushes. With a light touch, it's a pretty blush to get that flushed look on your face. It isn't the most unique colour out there though, as it reminds me of one of my NARS blushes. I also picked up the lipstick in Ethereal Orchid, described as a mid-toned dirty coral. In the tube it looks more like a nudey-brown-tinged pink colour, but really does come off coral on the lips. It's in a Lustre finish, quite shiny and rather thin, so don't expect it to hang about for very long. I had to reapply quite often, but that's probably because of my bad habit of biting my lips more than anything else! I would say though, each application with minimal drinking/eating in between should last you about three hours before you need to apply another coat. It's not the most moisturising formula, but it's not the most drying either, so I would suggest treating your lips to some lipbalm before wiping it off and applying the lipstick. As for the Beauty Powder? Well, unfortunately I can't review that, because I had to send it back straight away. MAC in all their wisdom, post products by Royal Mail, and in minimal packaging, so it came in a simple thin jiffy bag with no extra padding. I opened the bag up to find that it had been dented, bent up at one corner, and it must have been knocked really hard because the lid no longer aligned to the bottom. Needless to say I was very upset and had to return it. I wrote a note to point out that it arrived damaged, and even wrapped it in more bubble wrap to stop it breaking. I'm keeping my fingers crossed I'll get a refund, and will then try my luck in Selfridges to see if they have any stock in left still. MAC, if you read this, I don't want you to go down the other route where you used massively oversized boxes to send things, but considering how much money I paid for one product, perhaps using small boxes might be an idea? So, thoughts. Apart from the disappointment of receiving a damaged product, and the possibility of never getting it (the power of the words 'MAC' and 'Limited Edition' tend to do that anyway), it's a very pretty collection. I wouldn't say the products themselves have blown me away entirely, and the colours seem fairly dupable. The prices are also eye-watering/heart-stopping/"oh my god my boyfriend/mother is going to kill me if they find out I spent this much! "-panic inducing, especially when what you're really paying for is the packaging. However, if you read the inspiration and thoughts Guo Pei had about this collection, 'the garden of the soul' and the spirit of happiness, I think you'd find it difficult not to feel a little happiness and tranquility when you look at this collection. One word of advice though for keeping up that calm 'garden of the soul': just don't look or show anyone the receipts for these, ok?